Parker Bows is one of the leading manufacturers of compound bows, crossbows and crossbow accessories in the United States. And it wouldn’t be there if not for its long-standing partnership with Vector Industries. “It’s fair to say that Vector plays an important role in keeping Parker cost-competitive in the marketplace,” said Rob Mason, the president of Parker Bows, which is based in Augusta County. Parker, founded in 1984, has had a working relationship with Vector Industries, which employs and trains persons with diverse disabilities to enable them to reach their potential as productive community members, dating back more than a decade. Vector employees work year-round on projects for Parker Bows, focusing on pre-assembly and packaging work that would be expensive for Parker Bows to undertake in-house. “We have to prep certain parts, so we have to talk a bolt, a bezel and a washer, three different parts, and prep those three things together. We’ll take an axel that has a little slot on the end of it and put an e-clip on it. They’re excellent for doing those kinds of tasks, and we have, literally, dozens and dozens of those kinds of tasks that they help us with,” Mason said. Parker Bows has around 45 full-time employees at its facility in Greenville, about 15 miles south of Waynesboro. Mason, a graduate of Virginia Commonwealth University with an MBA from New York University, credits the staff and management at Vector Industries for their creativity and flexibility, two traits that have made Vector indispensable to Parker over the years. “The reality is that things come in fits and starts, and sometimes you’ll have a project that will materialize that hasn’t materialize before, and you need Vector to jump on it and get it done in a very short period of time, maybe a few weeks, or over the course of a couple of months, and then the project will go away. That’s the way business works,” Mason said. There’s also a feel-good aspect to the relationship that is important to Parker Bows. “It’s very important to us to support Vector. You have dozens of folks who have a very strong desire to work and be productive. We feel a strong obligation to provide them with meaningful work that can allow them to help earn a living and to be productive,” Mason said. 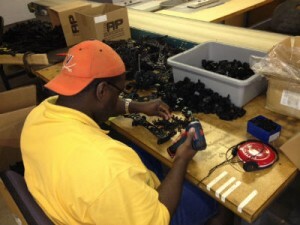 As much as it makes Parker Bows feel good that it is helping provide meaningful work to people with disabilities who want to earn a paycheck, it’s the work that Vector Industries performs that has maintained the relationship over the years.